The method of digital image correlation (DIC) was applied to the digital image of orthogonal cutting parallel to the grain of hinoki, and the strain distribution near the cutting edge was evaluated. The wood fracture associated with chip generation was considered as mode I fracture, and the stress intensity factor KI for fracture mode I was calculated from the strain distribution according to the theory of linear elastic fracture mechanics for the anisotropic material. The calculated KI increased prior to crack propagation and decreased just after the crack propagation. The change in KI before and after crack propagation, ΔKI, decreased in accordance with the crack propagation length, although the variance in ΔKI should depend on the relationships between the resolution of DIC method and the dimensions of cellular structure. The calculated KI in this study was almost on the same order as reported in the literatures. It was also revealed, for the case of chip generation Type 0 or I, the stress intensity factor for fracture mode II could be negligible due to the higher longitudinal elastic properties of wood in the tool feed direction than the one radial ones, and the mode I fracture was dominant. 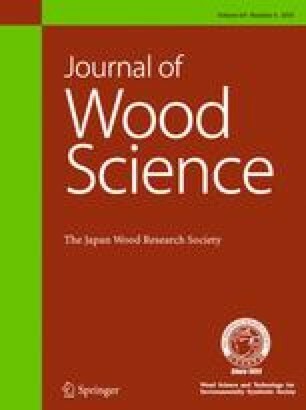 A part of this article was presented at the 67th Annual Meeting of the Japan Wood Research Society, Fukuoka, Japan, March 2017, and also at the 35th Annual Meeting of Wood Technological Association of Japan, Kobe, Japan, September, 2017. Authors would like to express sincere thanks to Kanefusa Corporation for providing the cutting tools.